The three most important questions to ask a DJ about their equipment. 1. Do you use quality, professional equipment? 2. Do you have back-up equipment and is it at my event? 3. Is your DJ equipment maintained regularly? Any DJ you speak with should answer “Yes” to all 3 questions. If not, that DJ is not professional enough to insure against mishaps on your once in a lifetime day. At Music Box Productions, we use only state of the art equipment, to bring you articulate, full sound and vibrant exciting light shows. We’d like to familiarize you with our equipment. You may not recognize all of the brand names we use…that’s because these manufacturers specialize in pro audio equipment. Just because the more familiar manufacturers make awesome home equipment, doesn’t necessarily mean their mobile stuff is just as good. Below, you will find pictures and explanations of the equipment we use. The evolution of technology has afforded us the opportunity to deliver music in a digital medium to you and your guests. We have taken our extensive music library-kept constantly updated-and transferred it directly from CD to digital. Incorporating the use of a state of the art soundcard allows us to keep a consistent CD quality sound for every DJ that Music Box employs. But how do we control that sound? Music Box Productions does it right. Some DJ’s are comfortable pressing “P” on their laptop keyboard to “P”lay your special song. Music box DJ’s are not! Combined with CUE we utilize a high quality Digital Audio Controller also called a DAC. The DAC allows your DJ the ability to manipulate any song exactly as if they were using a CD player. Everything Combined enables Music Box Productions to provide a seamlessly mixed show for your event! As a Backup to CUE your DJ carries a Cortex HDC-1000 Professional Digital Audio Player. 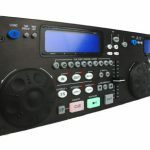 The Cortex is used by those DJ companies that want a durable, reliable digital audio player that will last a lifetime and work like a horse in the meantime. It has it’s own built in souncard and inputs for any USB storage device. Your Dj utilizes a 750 GB Back-Up hard drive with the Cortex, this insures that should anything happen with your Djs laptop, your party will never miss a beat. This digital player, like all of our equipment here, is regularly maintained by our full-time equipment technician. 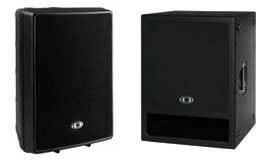 Just like your car, DJ equipment needs constant maintenance and TLC. You can be rest assured that none of our equipment is ever neglected. The Rane MP-24z receives it’s signal from the sound card. The MP-24z is perfect for mobile work, it has 4 separate channels with an assignable crossfader and multiple input options giving your DJ lots of range in regards to what can be run through his board. Everything from microphones to an acoustic guitar to turntables, the MP-24z can handle it. The MP-24z also allows a DJ to manipulate the bass, treble, and mid-range and even the amount of signal that goes to the amplifiers–which is our next stop. 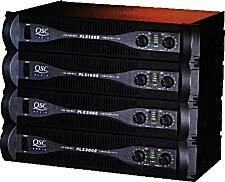 The QSC PLX-2402 and PLX-3002 amps offer ultra high performance and reliability while being ultra-low on the external noise to deliver the cleanest, most crisp sound at your event, no matter what the volume. At Music Box Productions, we use Audio Technica 2100 series microphones, the industry’s standard. Our cordless microphones are capable of 10 different channels, which means your Dj can switch frequency if someone else in the building is using the same frequency. We also use corded microphones that are always plugged in and ready to go as back-up, just in case! First of all, we needed a light effect that could fill an entire dance floor with light, be exciting, but not cheesy or overwhelming. For this, we use the Raptor by Martin. 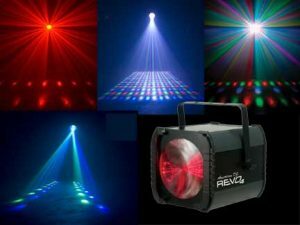 The Revo 4 by American DJ is an amazing light, with over 256 LEDs it can fill any size dance floor with a vast amount of different patterns that will move with the beat of the music. The versatility and numerous patterns make the Revo 4 a great center piece fir our light show; unlike most lights that have the same repeating pattern over and over again, the Revo 4 allows us to change it up over and over again. Small yet deceptively fast and powerful, the Raptor creates an eye-catching show with more than 70 razor-sharp, ever-changing, colorful light beams. The Raptor is a very cool effect, and when used properly with the addition of fog, creates a tunnel of light on the dance floor. The Raptor has nine different beam patterns and three colors which rotate on a mirror prism. The Quad Gem is another light fixture that provides wide coverage to fill the dance floor with light. It is a moonflower effect that creates tantalizing patterns of blue, green, red, and white colors. As the name states it is small in size, but packs quite a punch, filling the room with dancing rays of light without being over bearing or cheesey. 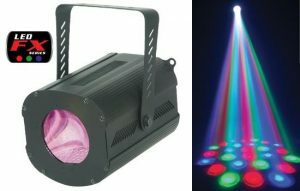 This fixture made by Chauvet also moves to the beat of the music providing just the right amount of movement and color to the dance floor. 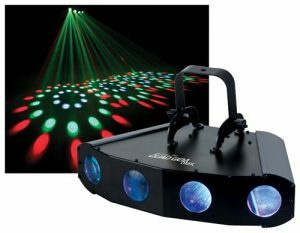 Needing something to change it up and fill-in spots that the other lights cannot, the LED Vision by American DJ does just that. 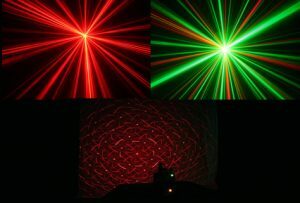 This is a moon flower effect that emits rays of green, blue, and red lights that move to the beat of the music. Thinking about how we could tie all of the lights together, we found the X-Laser. This unit provides crisp, clean, red and green rays of lights. Those rays of light complete the fill of light on the dance floor by moving to the music keeping all of your guests moving to the music too. Last but not least, we couldn’t forget about our slow dances! For this, we use a very subtle effect called a Starball. 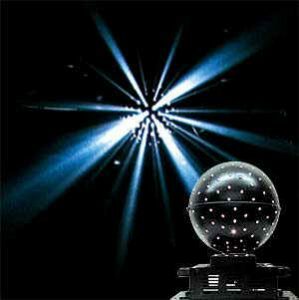 It’s a black globe that emits bright white beams of light through dozens of pin holes, and rotates slowly. 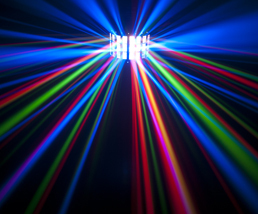 Much, much more elegant than the old disco ball, this effect creates an unrivaled level of romance for your couples dancing slow on the dance floor. 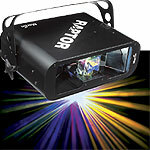 Visit our DJ Profiles to see these lights in action. Need more? Contact MBP today to schedule a meeting to see for yourself what we can do for you.